The One Club for Creativity and MullenLowe founded FGWF this spring to inspire students to use creativity to curb gun violence. On Friday, the Fearless Girl statue in New York City was transformed into #FearfulGirl. 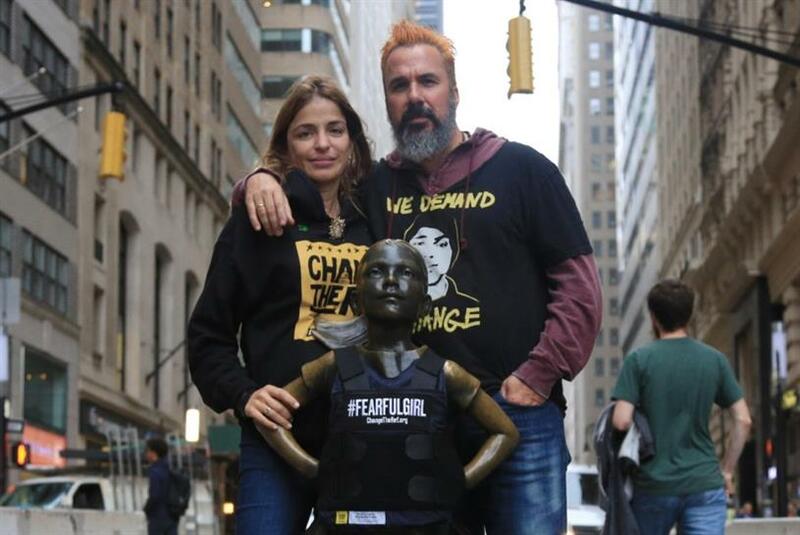 Manuel Oliver, father of 17-year-old Joaquin Oliver who was killed during the Parkland school shooting in February, draped a bulletproof vest over the bronze statue in an effort to promote sensible gun laws ahead of Tuesday’s midterm election. Oliver and his wife Patricia’s nonprofit Change the Ref, which seeks to empower youth to use creativity and urban art to fight for change, partnered with Fight Gunfire With Fire (FGWF) on the effort. FGWF was founded this spring by The One Club for Creativity and MullenLowe to encourage students to help stop gun violence in America using creativity. MullenLowe supported the #FearfulGirl initiative on a pro bono basis. Production credit goes to Matt Azelton and ps260. "I’m sobered by what Manny and Patricia have accomplished to fight gun violence - but at a high cost. No one should have to lose their child to gun violence," said MullenLowe U.S. Chief Creative Officer Mark Wenneker, co-chairman of FGWF. "I’m also grateful they decided to work with Fight Gunfire With Fire to use the power of student ideas to help their cause." Three advertising students from the University of Alabama, including MK Holladay, Emeline Earman and Mingyu Jo originated the idea, which grew into #FearfulGirl. "Hundreds of submissions from youth around the world have been screened by the FGWF panel," said Wenneker. "There are some really powerful ideas but this is not a contest. Our goal is to make as many of these real. We are asking anyone who wants to make a difference to jump in." When asked why he and his wife decided to place the bulletproof vest on Fearless Girl, Oliver gave Campaign two reasons: "The brave attitude that our young leaders show to the gun lobby and irresponsible representatives. And the cruel reality that this nation is accepting in regards protecting our kids...We also showed how Joaquin leads an untraditional way of fighting injustice by using creativity and art." Fearless Girl, which launched last March on International Woman’s Day, has been honored many times over the last year and a half, including winning multiple Grand Prix awards at the 2017 Cannes Lions Festival of Creativity and the 2018 North American Grand Effie. McCann created the statue of the young girl who is defiantly standing up to the famous Wall Street charging bull for State Street Global Advisors. The girl has been heralded around the world as a symbol of female empowerment. Representatives from McCann deferred comment to State Street Global Advisors, which was not immediately available for a statement. Is there life after New York City?